From the dust of the manger… to our heart. Available at amazon.com in paperback or Kindle. Christmas Day is one week away… wow! Where does the time go? Wasn’t it just spring break? Or summer vacation? In the midst of all that is wrong in the world today, as we think about the Christmas story, the one thing that we might perceive to have been wrong, was actually right. Yes, it was right for Mary to place Jesus in a manger. While they were in Bethlehem, the time came for Mary to have the baby, and she gave birth to her first son. Because there were no rooms left in the inn, she wrapped the baby with pieces of cloth and laid him in a feeding trough. She placed Him in a feed trough. In the Ancient Days most feed troughs in caves were merely hollowed out logs or rocks sitting on the ground. You can’t get much lower than that. Jesus, God in the flesh. God who sits on the highest throne in the highest Heaven, squeezed Himself into a human form. And if that wasn’t low enough, He was then placed mere inches above the dirt and manure that was in that animal cave. Why would God do that? Send His son. To the lowest possible place on earth?! To a feed trough? Think about the trough being in the dirt and mud on the cave floor. Like Adam from the Garden of Eden, we all began our lives in the dust of the earth and Jesus knows that we all have dirt and mud in our lives. That’s where we need Him most! The apostle Paul also notes that Jesus gave up His place with God in heaven and made Himself nothing (Philippians 2). Why? Simply because He loves us. He loves you. He really does. Even though you may be a little dirty. Even though you may be a lot muddy. It doesn’t matter to Him… He has been there too. Isn’t that incredible!?! God in the flesh has been where you are… only His love can pull you out of the pit you are in. He is uniquely qualified to be our Savior. He knows how messy our lives are… and it doesn’t stop Him from reaching out His loving arms to lift us up. 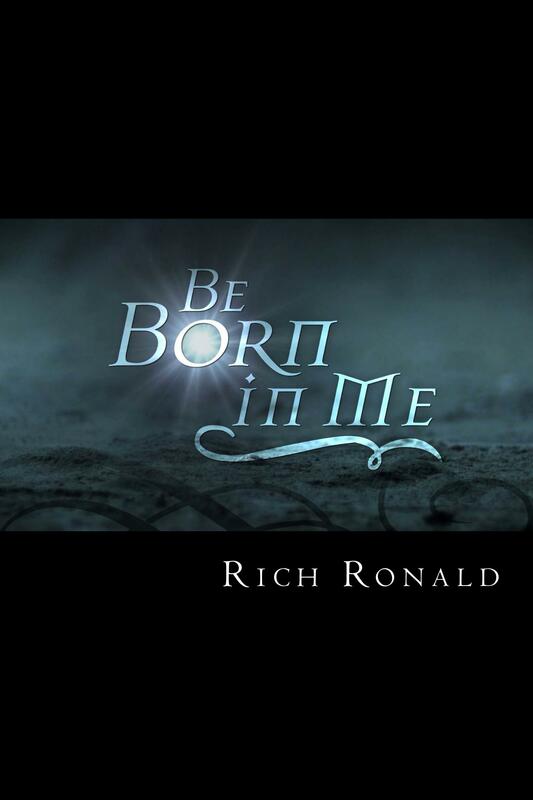 Be Born in Me is divided into five sections and includes discussion questions so you can use in a weekly small group, family devotional or class setting. Here’s the link to the amazon web site: http://amzn.to/SNOkND. And here’s the link to the Kindle site: http://amzn.to/RI7ODe. Author richlyspeakingPosted on December 18, 2012 December 18, 2012 Categories Be Born in Me, Devotional Messages, UncategorizedTags Advent, Be Born In Me, Devotional, Jesus, Joy, love, manger, Mary, Rich RonaldLeave a comment on From the dust of the manger… to our heart. Advent continues its countdown to Christmas Day. The great thing about the season, is that it can be just that… a season. Not just a single day. Jesus came to give us life, true bread and true sustenance. Jesus is all we really need isn’t He? He satisfies, gratifies and strengthens us spiritually, just as bread does physically. And what happens when you don’t eat for awhile? You become weak, right? May I encourage you as you enjoy a meal or two or three with your friends and family this Christmas season, to remember that Jesus is the true bread. He is our Jehovah Jireh, our Provider, who gives us all we have and all we need. And may you allow your heart to be His Bethlehem… to be born in you. This is the second week in Advent, a time to celebrate Christmas for a whole month, not just a single day. How are you doing at preparing your heart for the season? Do you know that you have been chosen by God for an assignment today and everyday? How does that make you feel? For some, it is overwhelming. For others it is exciting. For me it is humbling. Humbling, because most days I feel completely inept at doing something for our great (announcer voice here) GOD, THE CREATOR OF THE UNIVERSE. But that is the point, isn’t it? For the greatest impact, God uses the everyday person to reach the everyday person. You don’t have to have a Bible degree or years of ministry training. You can grab a cup of coffee and walk to the end of the driveway and share His story with your next door neighbor. You can sit on the floor with a bunch of preschool students and sing simple songs. You can offer a hug to an elderly woman in a nursing home wheelchair. He has chosen you to carry His message and His love to those around you. And there is no better time to do so than at Christmas. People in our culture are open to hearing about Jesus, and talking about spiritual things, more so during December than any other time of the year. So may He give you the heart of Mary to bring His joy to your world this Advent. And be encouraged to know that He has chosen you to do so.